The Canadian War Museum is an architecturally unique building showcasing the history of Canada’s past conflicts. Honoring those who have served the country and putting focus on the topics of regeneration and building a better future, this Ottawa museum is home to themed exhibits, historical artifacts, and military tools, weapons, and vehicles. Opened in 2005, the low-slung, angular concrete building—which was designed to capture the severe look of a bunker—blends seamlessly into a hillside and conveys solemnity. Its unique green roof is a self-sustaining ecosystem comprising 11,500 square feet (10,684 square meters) of tall grass. Inside, Canada’s extensive military history and the stories of its soldiers are told through photos, interactive displays, artifacts, personal stories, and special temporary exhibitions. Permanent collections include Early Wars in Canada, the Second World War, From the Cold War to the Present, Memorial Hall, and Regeneration Hall. 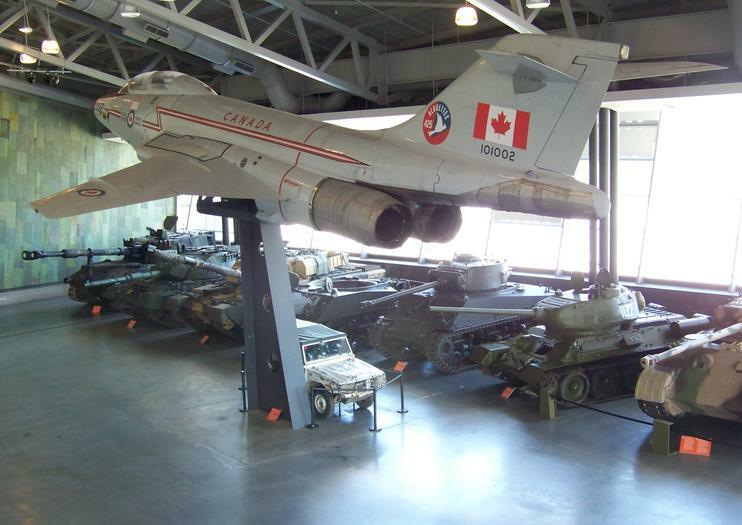 Visit the past in the Royal Canadian Legion Hall of Honour to learn about burial practices throughout history, and return to the present in the Military Technology Collection, where artillery vehicles and fighter jets are on display. The Canadian War Museum is a must-see for military and history buffs. Book and print tickets in advance to save time at the admissions desk. Admission is free on Thursdays from 4pm to 8pm. The on-site café offers breakfast and lunch items in a lovely modern setting. A museum guide is available online and on-site in English, German, Italian, Japanese, Korean, Mandarin, Portuguese, and Spanish. The museum is accessible to wheelchairs, motorized, wheelchairs, and strollers, all of which are available at the information desk. The Canadian War Museum is at 1 Vimy Place, a short distance from Parliament Hill. It is accessible from downtown by public transportation, taxi, foot, or bicycle—in fact, the museum offers easy access to walking and cycling paths along the Ottawa River that lead to other Ottawa attractions. Paid parking is available at the museum. The Canadian War Museum is open daily from 9:30am to 5pm, and until 8pm on Thursdays. The museum hosts special events and traveling exhibits on an ongoing basis; check online for the current schedule. Note that summer festivals may disrupt museum access and hours. The Canadian Tulip Festival celebrates the return of spring, with over a million displays of tulips planted throughout Ottawa, Canada's capital. Book this 2-hour guided bike tour that takes place during the annual event available from May 12 to May 22. On your leisurely ride, enjoy expansive bursts of color as you pedal through gardens blooming with more than 300,000 tulips.